Pushed by NGOs and government regulations, some companies are changing the way they produce and dispose of their plastic waste. But to really begin reducing the impact of plastics on our environment and health, these efforts will have to grow across the globe. China, which is estimated to be the source of approximately 1/3 of the plastic pollutionclogging our oceans, has taken steps towards remedying its significant impact through a combination of policies and citizen-based action. The China Environment Forum talked to Mao Da, founder of China Zero Waste Alliance and co-founder of Rock Environment and Energy Institute, to learn more about how fighting plastic pollution fits in to China’s plan to be an ecological civilization. China Environment Forum: What are the largest challenges China faces in regards to plastic pollution, and what approach is China taking to overcome them? Mao Da: The problem of plastic pollution is huge—it’s not only a waste problem; it’s a natural resource problem, a production and consumption problem, and lifestyle problem. It is a comprehensive issue, and within China the scale of it is huge. It is impossible to face a problem of this scale without adequate high-level national policies that adopt a comprehensive and integrated perspective. We do have some laws and policies related to plastic pollution [the 2008 restrictions on ultra-thin plastic bags, the 2018 plastic waste import ban, the 2017 plan for mandatory garbage sorting in 46 Chinese cities, and developing plans to ban other forms of plastic waste in 2018]. However, these laws are fragmented and they haven’t managed the solid waste problem well, much less plastic waste. I think China can learn from the European Union, which is currently discussing a general policy on plastic waste. Since plastic is a cross-boundary and cross-sector issue, there is no single law, policy, or regulation pointed at one facet that can cope with this huge problem, so we similarly need a national, high-level, general policy to deal with plastic pollution. Such a policy needs to contain basic principles for dealing with plastic pollution, and these principles should be similar to those of the EU, which has a hierarchy principle system that has been adopted by many other countries as well as the UN system. This hierarchy puts source prevention as a priority, which means we need to avoid unnecessary production of plastic products. Following that is separation and recycling, and finally disposal at the bottom. In addition to a hierarchy, China needs an overall goal—that by a certain year we will reduce our plastic waste generation and use of natural resources to produce plastic by a certain amount. Regulating plastic waste recycling and disposal. we opposed the current renewable energy subsidy that supports burning plastic waste; this should be limited to biomass burning, not plastics. CEF: China recently banned plastic waste imports, why? How do you think this will impact plastic waste around the world? MD: We see the plastic ban as a positive because the basic rationale behind it is to protect the environment and peoples’ health. We have suffered many years from importing the dirtiest plastic waste. The government wants to promote domestic plastic recycling and waste separation, but if the recycling industry relies on imports there’s no incentive for them to recycle domestic waste. I know there is a global impact in the short term, creating some problem such as piles of plastic waste that cannot be shipped elsewhere to be taken care of, and China’s plastic recycling industry is struggling to do business. However, the immediate benefit is that we reduce our pollution from secondary waste recycling. Beyond this, in the long term this policy pushes every country and region to create their own recycling capacity, and only when they have their own capacity will they implement stricter regulations on the generation of plastic waste, separation, and control of the recycling process. There will no longer be a way to ship waste away and these countries will now need to care more about their environment when they have to handle the recycling themselves. CEF: How can international coalitions come together to work towards reducing plastic pollution? Build zero waste city models globally. Target major “fast consumer” products to reduce their plastic waste. Mao Da is the founder of China Zero Waste Alliance and co-founder of Rock Environment and Energy Institute. 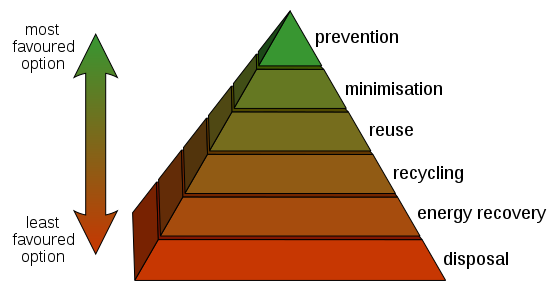 Image Credit: Waste Hierarchy courtesy of Wikimedia. Waste Container courtesy of Pixabay. Mayor Jesse Arreguín hosted an event Tuesday at Berkeley Recycling Yard to introduce legislation that deters city restaurants and cafés from using single-use plastics and foodware. About 20 community members gathered to listen to Arreguín speak in front of several mounds of plastic recyclables. The plastic in the background of the talk represented the volume of a day’s worth of single-use disposables collected in Berkeley, according to Martin Bourque, executive director of the Ecology Center, who also spoke at the event. Disposable-Free Dining, the new legislation, would require that Berkeley restaurants use reusable dishes and takeout foodware from a preapproved list of recyclables, according to a press release. In addition, vendors will charge 25 cents for every disposable beverage cup or food container provided. Other disposable utensils, straws and napkins will be provided only upon request or at self-serve stations. While there are waste-reducing legislations concerning disposable straws in Sacramento and a plastic bag ban in Alameda County, Disposable-Free Dining is the first of its kind to prohibit all types of disposable plastic materials, Arreguín said during his speech. Other speakers included Shilpi Chhotray, senior communications officer of Break Free From Plastic; Samantha Sommer, the waste prevention program manager for Clean Water Action; Jackie Omania, a third-grade teacher from Oxford Elementary School; and Mabel Athanasiou, Brazil Fisher-Johnson and Sam Felix Domingo, three of Omania’s students. According to Bourque, it is expensive to handle plastics because of food contamination and the sorting process. He noted that since 2013, the tonnage of plastics has risen while their prices have continued to drop. Sommer noted in her speech that she believed businesses will not lose profit through this legislation, using the ReThink Disposable campaign, which assists food establishments in implementing cost-saving practices that eliminate waste, as an example. Through this campaign, businesses saved between $1,000 to $22,000 a year, while eliminating 85,000 to 150,000 disposable pieces of plastic packaging, according to Sommer. Over the past three years, Omania’s class has reduced its waste from five four-gallon bags of waste in the span of a year to a one-quart jar. “If we 21 nine-year-olds can have a zero-waste classroom, then Berkeley can be a zero-waste community, too,” Athanasiou, one of Omania’s students, said to the crowd. Berkeley City Council referred the legislation to the Zero Waste Commission, which will continue to hold public meetings to obtain additional input. Bourque hopes that the legislation will be enacted as early as July 2019. Contact Andreana Chou at achou@dailycal.org and follow her on Twitter at @AndreanaChou. Our oceans, river systems, marine animals, and health are being threatened by a pollutant that’s all around us, yet sometimes invisible to the eye: plastics. Whether it’s an empty bag of chips floating in a nearby stream or microplastics ingested by both humans and marine animals, plastics have become a ubiquitous and destructive commodity. As our plastics production and consumption continues to increase, the world is now faced with the growing question of what to do with our plastics problem. Scientists became aware of the damage of plastics—particularly marine plastics—in the 1950s. While our understanding of plastics’ impact has expanded since then, there have been few policy measures implemented to deal with the issue. But this year could change that. In addition to dedicating Earth Day to ending plastic pollution, the environmental community is also pressuring global and policy leaders to seriously address the plastics crisis. After agreeing in December to spearhead the fight against marine plastic pollution, the United Nations Environment Assembly (UNEA) will be organizing its first-ever meeting to discuss marine litter and microplastics at a global level. An expert group tasked with examining options for combating marine plastic litter and microplastics will meet for the first time next month, providing a policy window that could finally address the global issue of marine plastics pollution. But, as a joint statement written by the Women’s Major Group, the Worker’s Major Group, the NGO Major Group, and other organizations notes, true solutions need to be global undertakings that not only remove existing plastic pollution from our environment, but also significantly reduce plastic production and consumption. As such, we call on the expert group to consider a legally binding global framework to manage the full lifecycle of plastics. Up to 12 million metric tons of plastic leak into the oceans each year, and this rate could double by 2050 if our waste management systems aren’t improved. On top of that, more than half of microplastics remain on land, eventually flowing into land and freshwater ecosystems. Plastics also harm the health of both marine animals and humans, exposing us to toxic and endocrine-disrupting chemicals, among other health hazards. Despite this, annual plastic production reached about 311 million tons in 2014 and continues to rise rapidly due to new developments in cheap shale gas. Given these statistics, it’s not enough to simply expand recycling. There needs to be a global effort to cut back on our production and consumption of plastics altogether. Right now, our waste management systems are not equipped to solve the plastics problem alone. Currently, there are no waste management mechanisms in place that could outcompete the overproduction of plastic or even clean up the amount of plastic that goes into the environment. As a matter of fact, most plastic doesn’t even end up at these waste management systems in the first place. Only nine percent of all plastic ever discarded since 1950 has been recycled, leaving the rest to get stuck in our environment for millennia. One of the major contributors to plastic pollution is packaging, especially those designed for single use. Only 14 percent of plastic packaging is collected for recycling globally. Other existing solutions like incineration, “waste-to-energy,” and “plastic-to-fuel” methods only deal with plastic at the end of their lifecycle. Our management systems are not equipped to solve the environmental impact of ever-expanding production of plastic, an equally problematic aspect of plastic’s lifecycle. Almost all plastics are made from fossil fuels, accounting for 20 percent of total oil consumption and 15 percent of the global annual carbon budget by 2050. And plastics expend carbon from the time they’re made to when they’re thrown away, from extraction, pipeline and refinery operations, production and conversion, to end-of-life treatment like incineration. Because of this, CIEL and our partners are pushing for a holistic approach to solving plastics—one that accounts for waste management, reverses the trend of increasing plastics in the environment, and reduces toxic exposure to humans from plastics. Tackling marine litter isn’t enough. It’s time to take true action to #EndPlasticPollution. Manila, Philippines (April 20, 2018) —As part of this year’s Earth Day celebrations, #breakfreefromplastic, a global movement backed up by more than 1,100 organizations, is urging governments worldwide to restrict or eliminate the use of single-use plastics (SUPs), stressing that the unrestrained production and consumption of disposable plastics is bringing on a plastic flood of crisis proportions. Citing the lead of 36 countries and hundreds of cities and local government units around the world that have already imposed prohibitions or levies on the use of single-use plastics like plastic bags, straws, bottles, cups and cutlery, movement leaders pointed out that more countries and institutions are expected to follow suit as consumer attitudes change and public revulsion over plastic pollution intensifies. “The good news is that more and more countries and cities are starting to take concrete measures to move their constituencies away from the nightmare of plastic pollution. We expect that increasing public awareness and anger on this issue will help galvanize other governments to do the right thing by restricting or prohibiting the use and proliferation of disposable plastics, especially when practical and ecological alternatives exist. Corporations that continue to dispense single-use plastics should start seeing the handwriting on the wall and respond by designing waste out of their products, ” said Von Hernandez, Global Coordinator of #breakfreefromplastic. Taxing or putting levies on the use of SUPs like plastic bags or banning them outright have proven effective in encouraging consumers to shift to alternatives. Such policies are also compelling corporations and institutions to innovate and invest more in research on sustainable alternatives. To commemorate Earth Day, #breakfreefromplastic member organizations around the world have initiated various activities asking corporations and governments to break free from plastic. Groups are taking “cleanups” a step further by identifying the brands responsible for plastic waste found on our beaches and beyond. The #breakfreefromplastic Brand Audit Toolkit is now available for those who plan to conduct a cleanup and brand audit in their respective areas. Last April 18, Greenpeace International also launched A Million Acts of Blue Toolkit which encourages individuals to push businesses, corporations, restaurants, and retailers to reduce their reliance on single-use plastics. For his part, Froilan Grate, Regional Coordinator of Global Alliance for Incinerator Alternatives (GAIA) Asia Pacific stated that local governments must also enact more holistic, ecological, and sustainable policies that complement prohibitions on single-use plastics. “Aside from banning the use of non-essential single-use plastic items, governments should also enact complementary policies that promote waste reduction and optimize recycling systems. In our experience, Asian cities that have embraced zero waste systems and programs have been able to demonstrate time and again the superiority of such strategies over the conventional dumping and disposal approaches,” Grate said. Earlier this year, the European Union (EU) also adopted an EU-wide strategy on plastics as part of the union’s transition towards a more circular economy. Under this strategy, there are plans to make all plastic packaging recyclable by 2030 and reduce the consumption of single-use plastics while spurring innovations in the way products are designed, produced, used, and recycled in the EU. “Previous EU legislation on plastic bags has been successful in reducing plastic pollution where it has been implemented. The potential to replicate this for other products and applications is huge and should be promoted. With the newly adopted strategy on plastics, we hope to see member states enact more policies that will curb the use of SUPs,“ said Delphine Levi Alvares, European Coordinator of #breakfreefromplastic . In the United States, Martin Bourque, Executive Director of the Berkeley-based Ecology Center, said that China’s ban on plastic scrap is forcing West coast cities to find alternate solutions. He shared his organization’s experience in proposing an ordinance which will reduce use of disposable foodware in Berkeley, California. “In Berkeley, we are proposing a Disposable-Free Dining ordinance to dramatically reduce our use of disposable foodware rather than trying to find new destinations for this problematic and hard-to-recycle material,” Burque said. The Ecology Center runs the first curbside recycling program in the US, providing service to Berkeley residents since 1973. #breakfreefromplastic is a global movement envisioning a future free from plastic pollution. Since its launch in September 2016, over 1,100 groups from across the world have joined the movement to demand massive reductions in single-use plastics and to push for lasting solutions to the plastic pollution crisis. These organizations share the common values of environmental protection and social justice, which guide their work at the community level and represent a global, unified vision. Washington, DC – More than one million people ahead of this year’s Earth Day (April 22) are demanding that the world’s largest corporations reduce their production of single-use plastic. Around the globe, over one million individuals have signed petitions, taken to stores and restaurants, and posted photos of ridiculous packaging on social media to call out corporations like Coca-Cola, Pepsi, Nestlé, Unilever, Procter & Gamble, McDonald’s, and Starbucks for their massive single-use plastic footprints. Greenpeace, as part of the #BreakFreeFromPlastic movement, is urging individuals worldwide to contribute to an additional “Million Acts of Blue”: escalating actions that push local businesses, corporations, restaurants, and retailers to reduce their reliance on single-use plastics. Ahead of Earth Day, artists have also created massive works of beach art throughout Europe calling attention to the issue of ocean plastic pollution. “We are reaching a tipping point on single-use plastics, and it is time for any corporation that cares about a healthy planet to go beyond recycling alone. Throwaway plastics continue to pour into our oceans, our waterways, and our communities at an alarming rate,” said Graham Forbes, a Plastics Campaigner at Greenpeace USA. In the U.S., Greenpeace activists deployed two signs near the Golden Gate Bridge in San Francisco that read “Break Free From Plastic” and “Stop Corporate Plastic Pollution,” featuring logos of seven companies with massive plastic footprints. Greenpeace USA is also bringing its hot air balloon with a Break Free From Plastic message to world’s largest environmental festival in Texas. In Russia, activists installed three billboards outside of a supermarket location for the country’s largest retailer, X5 Retail Group, calling on the company to act on single-use plastic bags. In the Philippines, Greenpeace partnered with a local artist collective to stage the ECOlta Fair and Plastic-Free party, which engaged individuals who aim to live free from plastic or reduce their waste. In South Africa, Senegal, Cameroon, and Kenya, Greenpeace Africa is working with volunteers to conduct beach and town cleanups and brand audits to identify the companies responsible for plastic pollution. In Spain, as part of a movement called #DesnudalaFruta, local groups are visiting retailers to demand solutions and educate consumers on the amount of plastic packaging with their products. In Mexico, a group of activists collected and photographed packaging from seven of the world’s largest companies. In Veracruz, plastic artist Francisco Javier Calvillo made a sand sculpture of a giant turtle with a message for corporations. “The solution is to turn off the plastics tap and decisively end the non-essential, single-use applications of the material. Increasing public revulsion over single-use plastics should be seen by policy makers and regulators as a sign that citizens want better protection from their leaders against the continuing onslaughts of an industry committed to pursuing bigger profit margins at the expense of a planet already drowning in plastic,” said Von Hernandez, the Global Coordinator for Break Free From Plastic. Earth Day has become an opportunity for many corporations to greenwash around recycling efforts and continue churning out throwaway plastic. This Earth Day, Greenpeace is looking to shift the narrative around single-use plastics from one of individual responsibility toward corporations reducing their production of throwaway plastic packaging. A study revealed that 91 percent of the world’s plastics have not been recycled. The equivalent of one truckload of plastic enters our oceans every minute. Plastic pollution can choke or entangle marine life, including seabirds, turtles, and whales. The United Nations Environment Programme (UNEP) estimates that ocean plastics are responsible for the deaths of hundreds of thousands of sea creatures each year. The international #BreakFreeFromPlastic movement is comprised of more than 1,100 groups, including Greenpeace, pushing for corporations to reduce and eventually phase out single-use plastic production. For photos of actions against single-use plastics around the globe, click here. For photos of EEB’s beach art throughout Europe, click here. For a wide photo and video collection of ocean plastic pollution, click here. For the Million Acts of Blue video Greenpeace released today, click here. Written by Perry Wheeler. Blog originally appeared at Greenpeace.